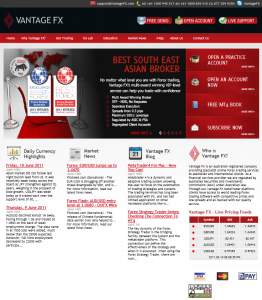 Forex Broker Vantage FX - Review. Vantage FX is an award winning Australian registered broker providing Forex trading capabilities to retail, high-net worth and institutional clients in Australia and the rest of the world. Vantage FX provide traders access to the Metatrader 4 platform, one of the most popular trading platforms, and offer some of the tightest spreads in the market, sourced from a variety of liquidity providers. - Spreads From 0.5 Pips. - No Dealing Desk. No Requotes. Straight Through Processing. - Funds Secure In Segregated Client Accounts at NAB. - NO Minimum Account Balance. - Expert Advisor Test Lab. Trading Platforms: MetaTrader 4, MetaTrader 4 For Mac, MetaTrader 5, MYFX Trading Console, MetaTrader 4 Mobile ( droidTrader, iTrader ). Account Types: Individual Application, Joint Application, Company Application, Trust Application.